CARACAS, Venezuela (AP) — Opposition lawmaker Juan Guaido declared himself Venezuela’s interim president last month, vowing to oust President Nicolas Maduro from power and end the once-wealthy nation’s deepening political and humanitarian crisis. Millions of Venezuelans have migrated, and those left behind struggle to afford scarce supplies of food and medicine. Guaido called upon the international community for humanitarian aid. The world watches now whether Maduro’s government will let the first shipments from United States cross its borders. Despite having the world’s largest oil reserves , Venezuela is in a historic crisis after 20 years of socialist rule launched by the late President Hugo Chavez. Dozens of political parties that make up Venezuela’s opposition have failed to mount a viable political challenge. Critics accuse Maduro, Chavez’s hand-picked successor, of unfairly winning an election last year for a second six-year term by banning his popular rivals from running. Some anti-Maduro leaders are jailed and others have fled Venezuela fearing for their safety. Last month, the 35-year-old Guaido was named leader of the opposition-controlled National Assembly. He’s managed to rally masses of Venezuelans into the streets to show their support, and he’s won backing from nearly 50 countries worldwide, including the United States. HOW DOES AID FIT IN? Offers of humanitarian assistance are coming in from around the world. The Trump administration offered Guaido’s interim presidency an initial $20 million in support and Guaido says the aid will come in through neighboring Colombia, Brazil and as yet unidentified Caribbean islands. 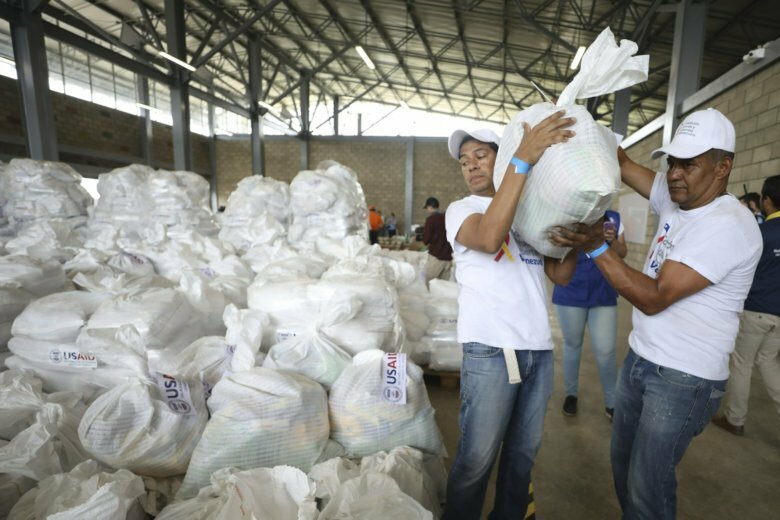 The first shipment includes food kits for 5,000 Venezuelans and high-protein nutritional supplements that can treat an estimated 6,700 young children with moderate malnutrition. It arrived at the Colombian border city of Cucuta, where volunteers are bagging them in preparation for attempts to bring them across the border. Maduro has refused the aid, disavowing any humanitarian crisis and saying Venezuela is not a country of beggars. He’s offered to try to resolve the political impasse in a dialogue with opposition leaders, which critics call a stalling tactic that has failed to lead to any changes. More defiantly, the socialist president contends that the aid is part of a U.S.-led coup against him, with a goal to colonize Venezuela and exploit its vast oil resources. The Venezuelan military has barricaded a bridge connecting the two nations with a tanker and two cargo trailers in an apparent attempt to block the aid. WHAT’S THE OPPOSITION’S NEXT MOVE? It’s unclear what will break the standoff playing out at the Venezuela-Colombia border. U.S. Ambassador to Colombia Kevin Whitaker said the U.S. will get supplies to the border, and Guaido will take it from there. Guaido has given few details of his strategy, but says the food and supplies will reach Venezuela’s most vulnerable people in the next days. Lester Toledo, who represents Guaido in the aid mission in Cucuta, issued a message to Venezuelan troops, telling them the aid contains food and medicine their own families need.